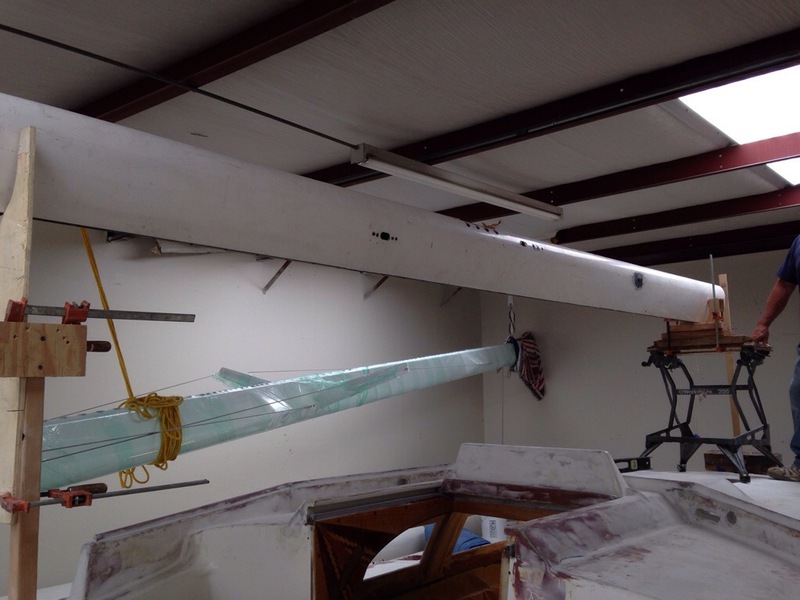 The shop neighbors who were perplexed by the stern tower were satisfied now by seeing the self-steering wind vane installed. 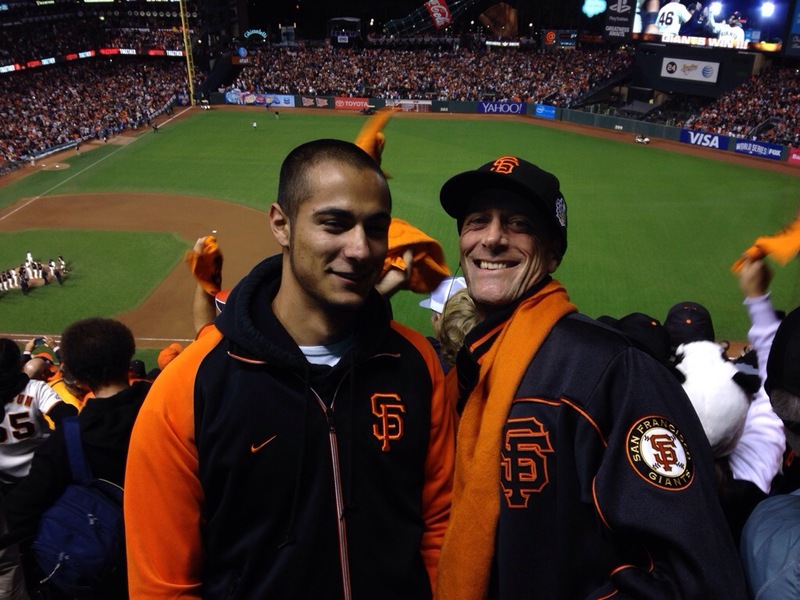 It’s the brown unit in these photos. 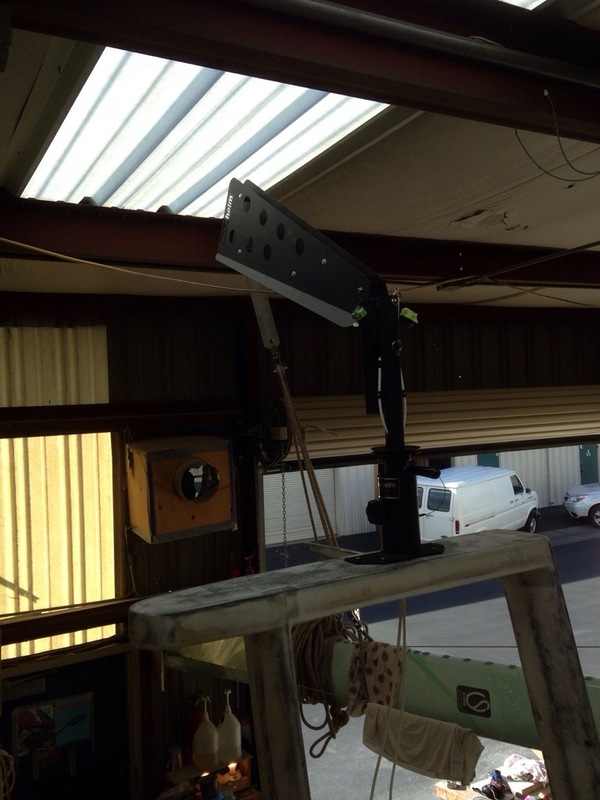 The actual vane that gets pushed by the wind is in a deeply “reefed” position, tilted way back to fit under the skylight ceiling. The rudder control cables come thru the tower shelf and will get tied to the legs and then routed to the (to be built) yoke atop the new rudder’s trim tab pivot pin. 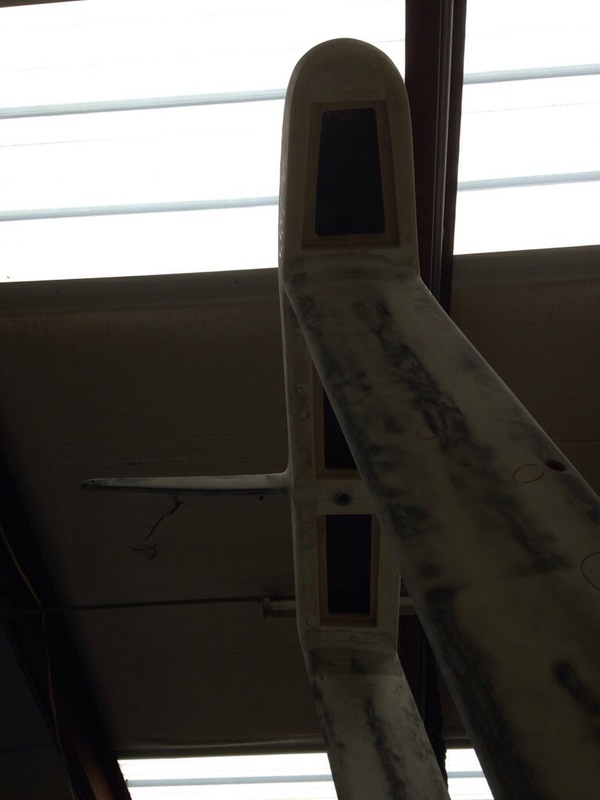 We’ll get back to those details in a couple of weeks when the rudder cassette is built. 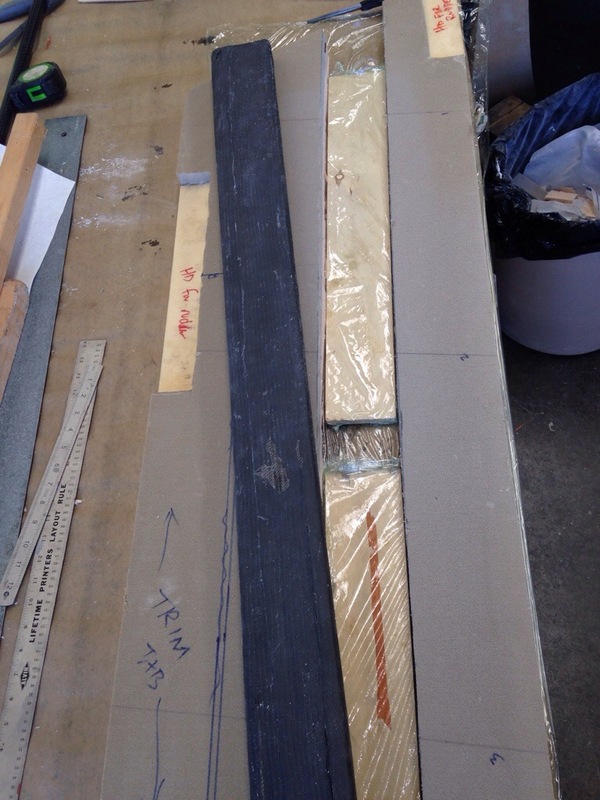 The rudder has been shaped, wrapped once in bi-directional carbon and had the 14 layers of carbon unidirectional cloth added in the recessed channels down both sides of the board. 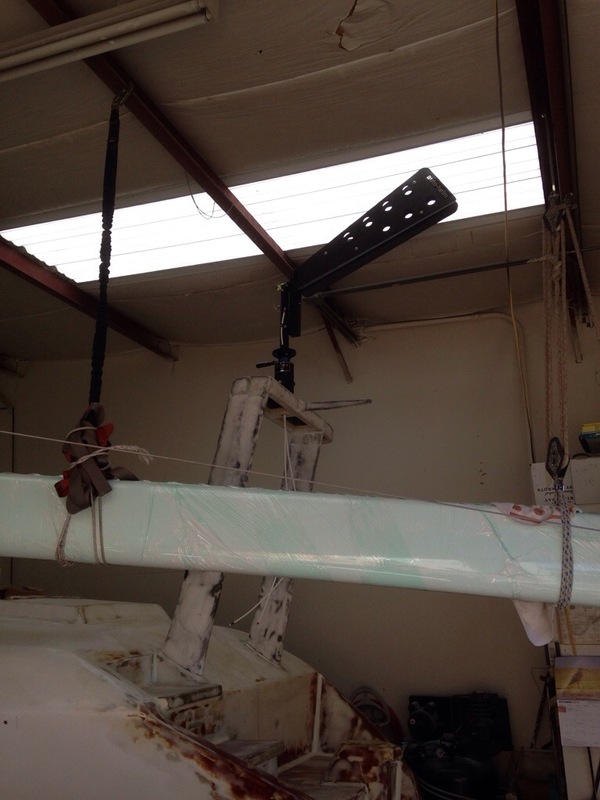 First, here’s a look at how that embedded pivot tube just fits inside the shaped rudder. And underneath the white fairing compound you can just see the staggered layers of carbon uni. 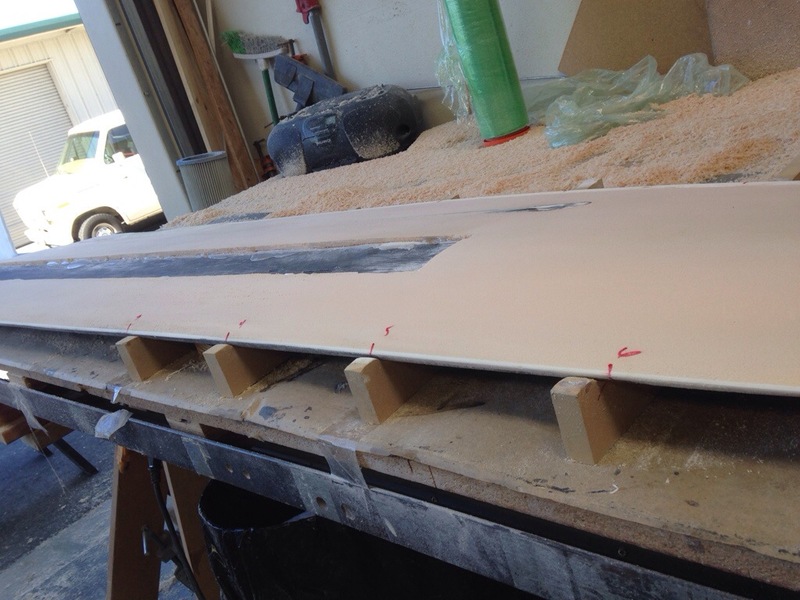 The only unexplained part of the rudder plans is how one would keep the blade’s curve intact over the area that gets cut out of the foam core and replaced by that big carbon-wrapped spine piece. So we have a flat spot there that I’ve had to build back up with fairing compound. I’m doing the fairing work now, before adding the final outer layer of carbon wrap. Ok, that side is done and we’ll need a few fairing sessions to finish the other. 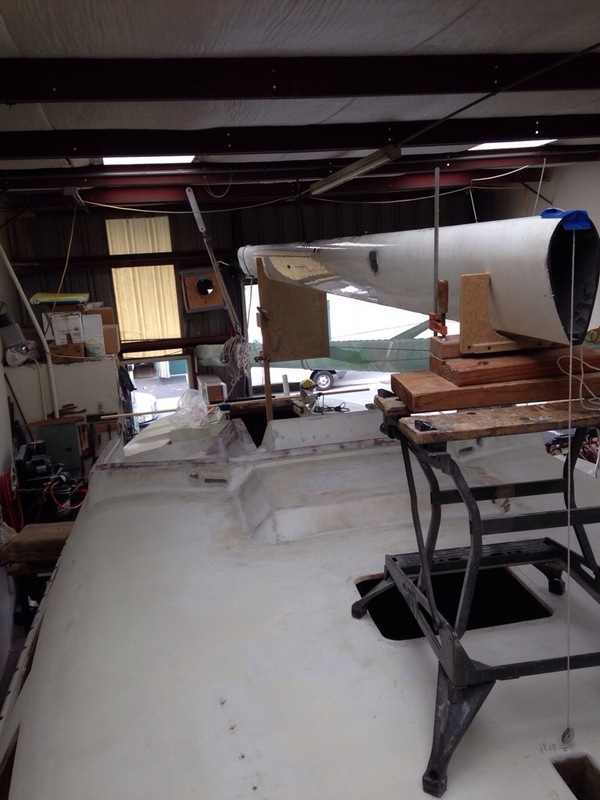 While the rudder layers cure, work progresses on prepping the windshield and hardtop for paint, and the floors for the aft cabin and equipment room. Pictures soon. 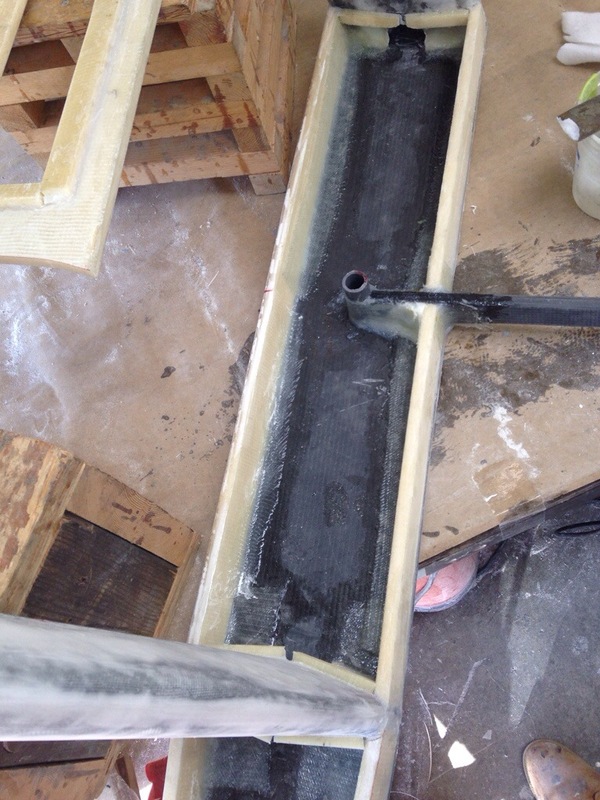 Then with the vacuum pump running we focused on the replacement carbon tube to encase in the rudder stock (next topic). 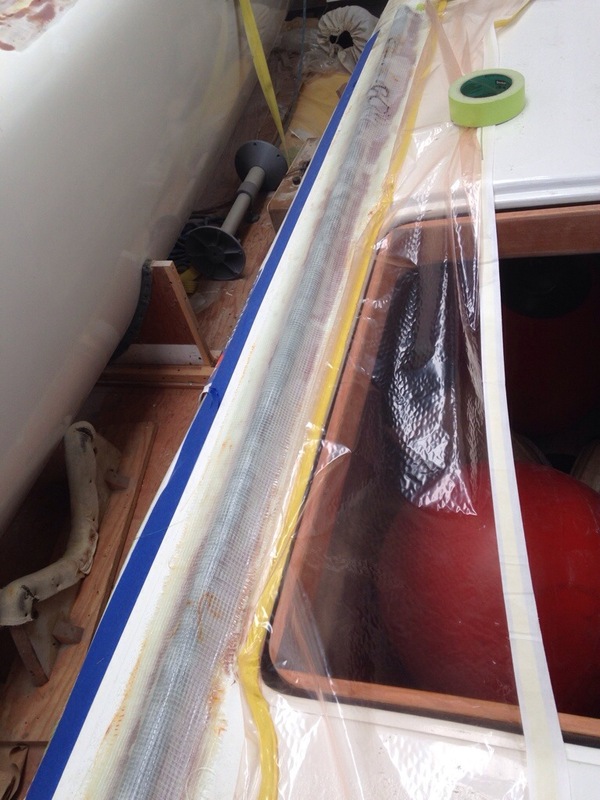 The next morning I happily unpacked the bagging supplies from the float deck to see our new net lashing tube bonded in place. Came out just fine. Once these tubes get faired and we cut the notches (same as was done on the beams and main hull), the float exteriors will finally be DONE! 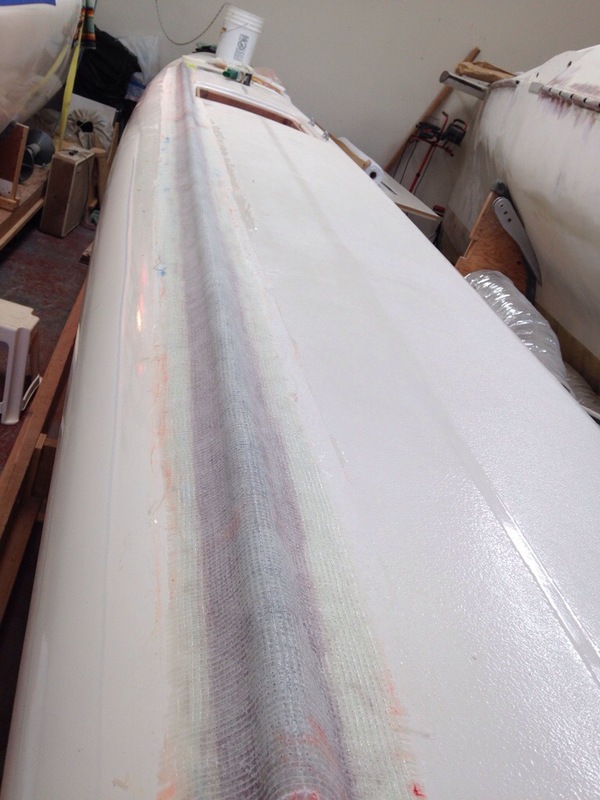 Now back to the new rudder. At least the $100 Rockwest Composites carbon pivot tube showed up within 48 hours, so we’re quickly back in business. 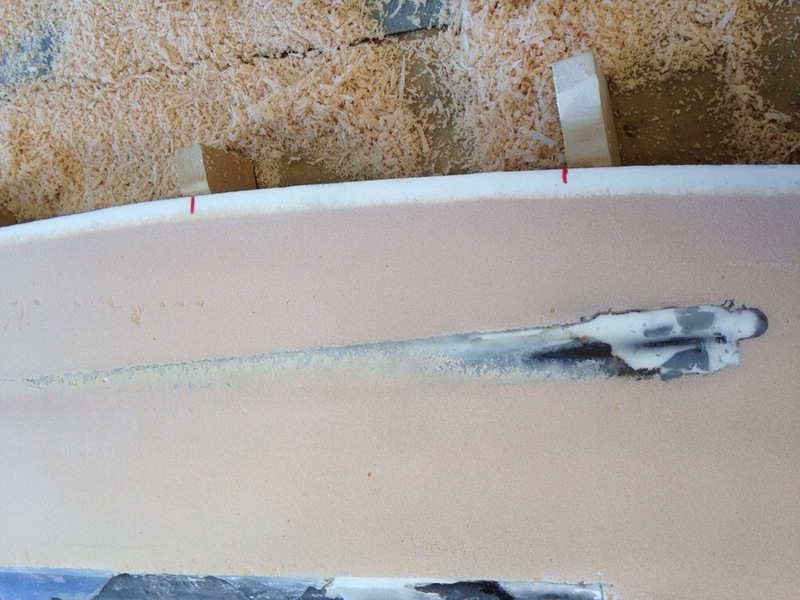 Charlie cleaned out that channel in the foam core to reset the proper depth. This time I used a more viscous epoxy and cabosil mix and pushed the tube in to a shallow puddle, and let that cure overnight. 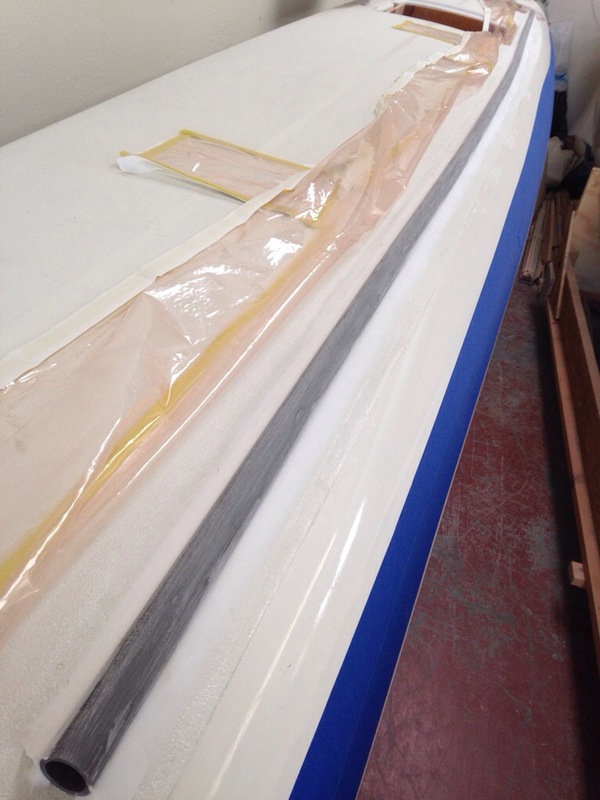 The next day saw further filling of epoxy mix to encase the carbon tube. 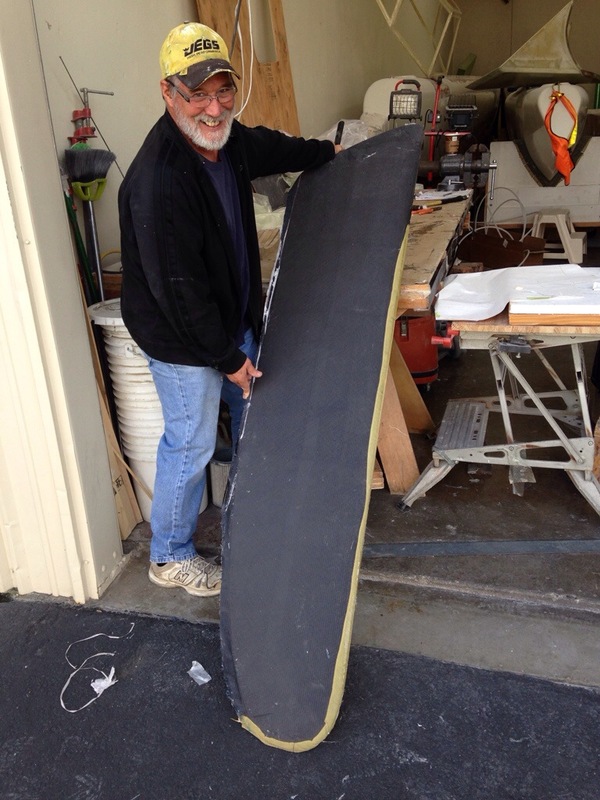 Now it’s game-on; get to shaping the rudder out of the foam core stock! 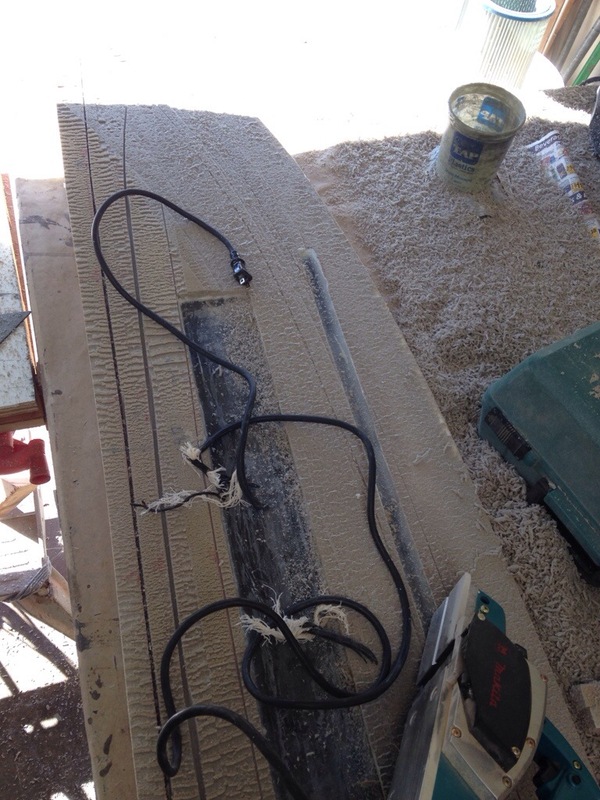 This time I only cut three depth lines with the circ saw and went right to the power planer. 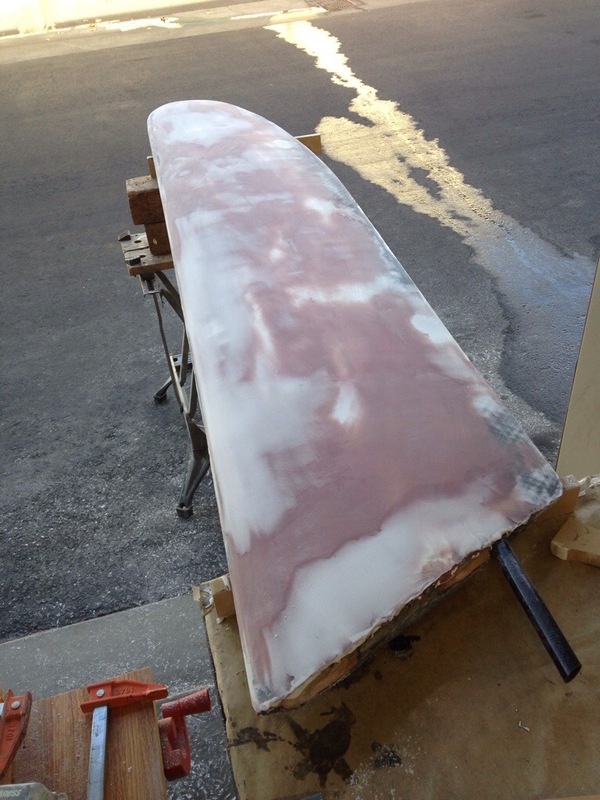 The long process I described months ago on the first rudder was cut down by about 75%, and this one is being shaped better too. But of course if you don’t mind the power cord, the machine quickly chews it up. 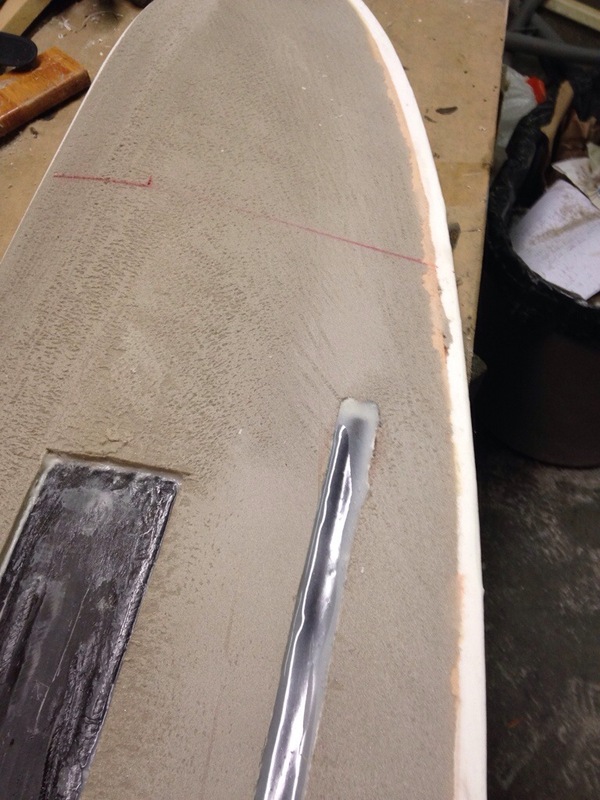 Tomorrow we’ll finish smoothing out this first rudder side, and when satisfied with the shape we grab the carbon fiber 12 layers of 6″ wide that needs to have more of the foam core rebated back to add this stiffener fabric. That step will make more sense with tomorrow night’s photos. 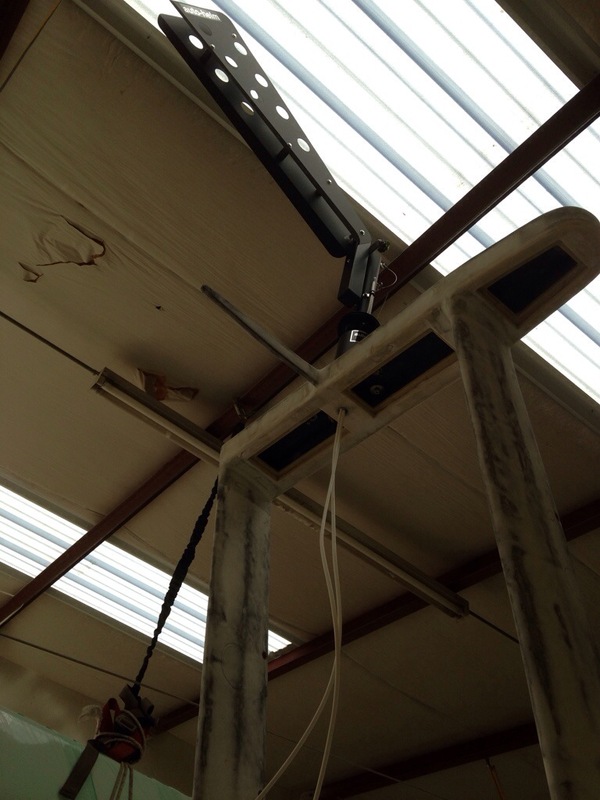 Here are a few more views now that the equipment tower is fabricated and faired. It will be getting a second horizontal ‘shelf’ but we’ll wait on placing that until figuring out if an electric tiller pilot (remote steering) can be mounted back there. This would be in addition to the primary windvane (no electricity needed) self-steering gear. 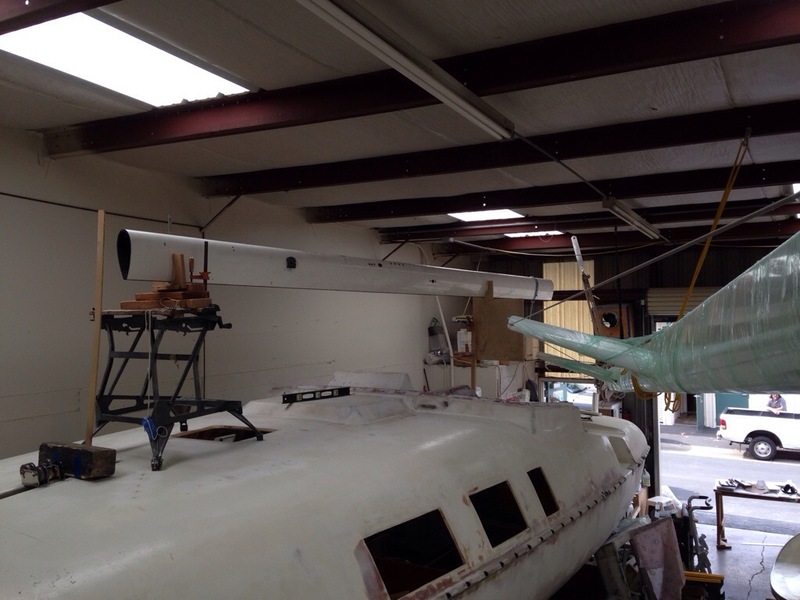 We need to have the completed tiller in place first. 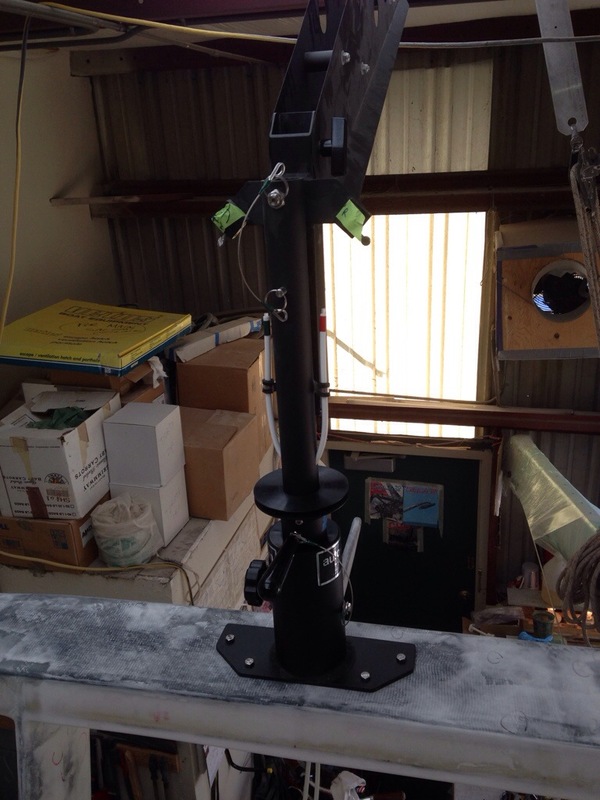 The top is a carbon deck and a simple hollow box below with access ports to hide the equipment fasteners and wires. 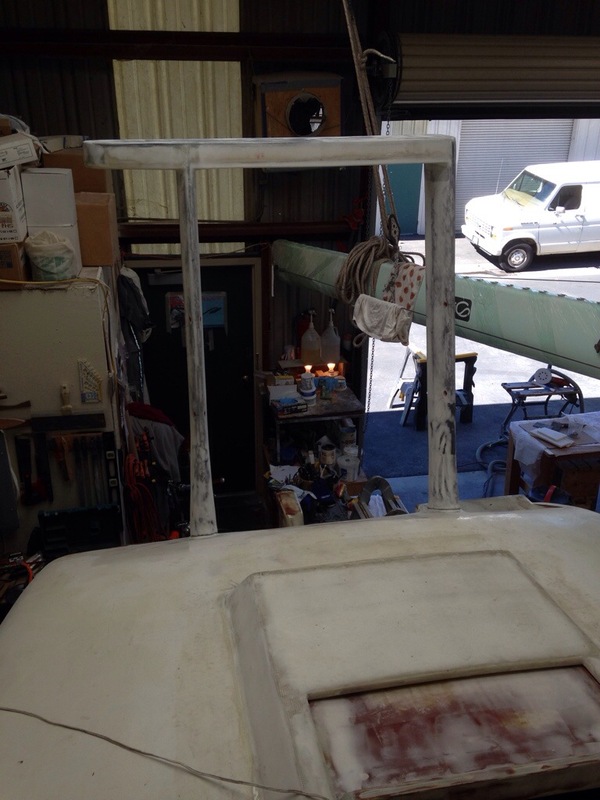 The hole in the center of the platform is a channel to pass the windvane’s control lines down to the rudder trim tab. And the horizontal stick out the back is a little gantry for lifting and holding the rudder out of the water once docked or anchored. The ear flap on the starboard side is for the radar; the port side is flush son you can get to the aft steps easily. I’m actually getting sick of the splotchy fairing patches look on all these big parts. 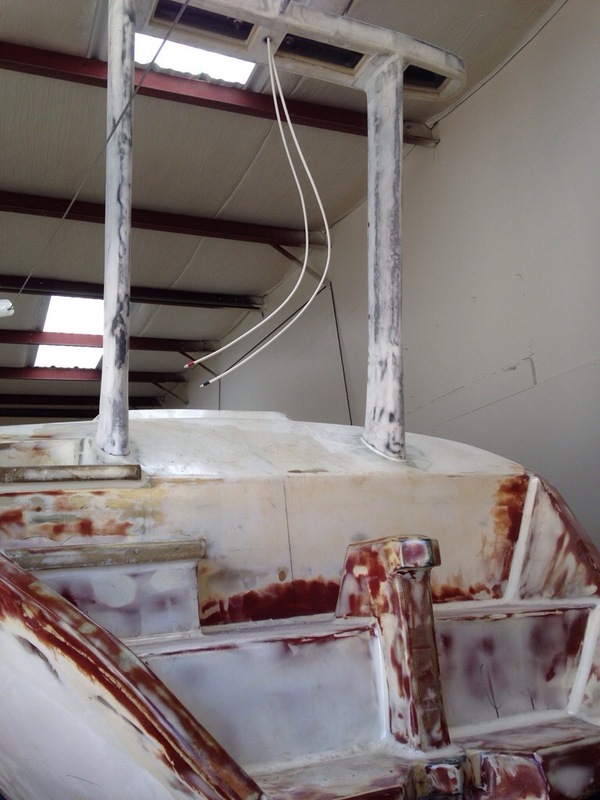 It’s about time to get things primer painted so a cohesive boat begins to emerge. 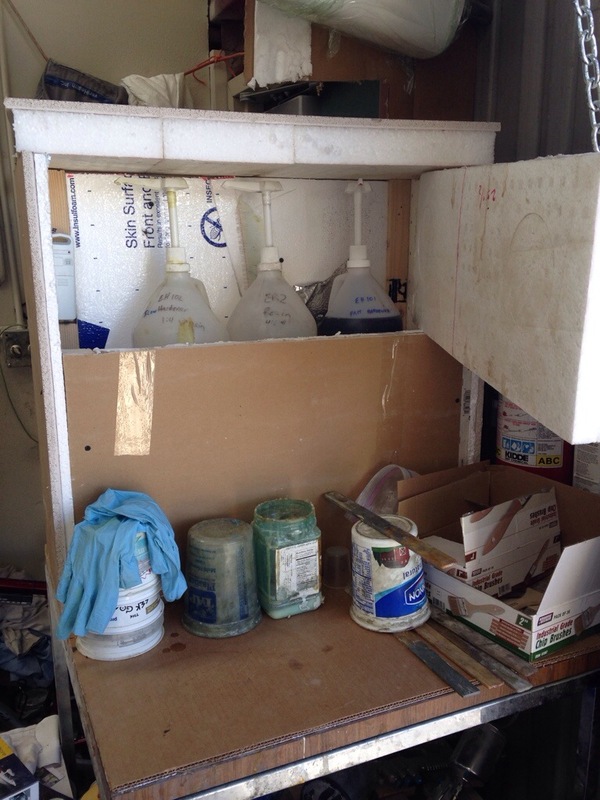 But we shouldn’t touch any painting until the fabrication work is complete. 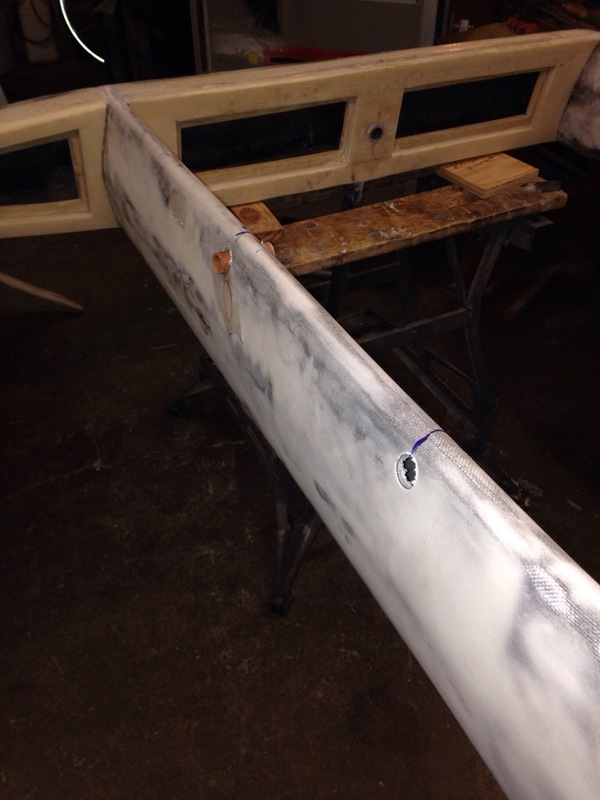 After the Jim Antrim meeting the steps on building the integrated trim-Tab rudder became clear, so work is underway. 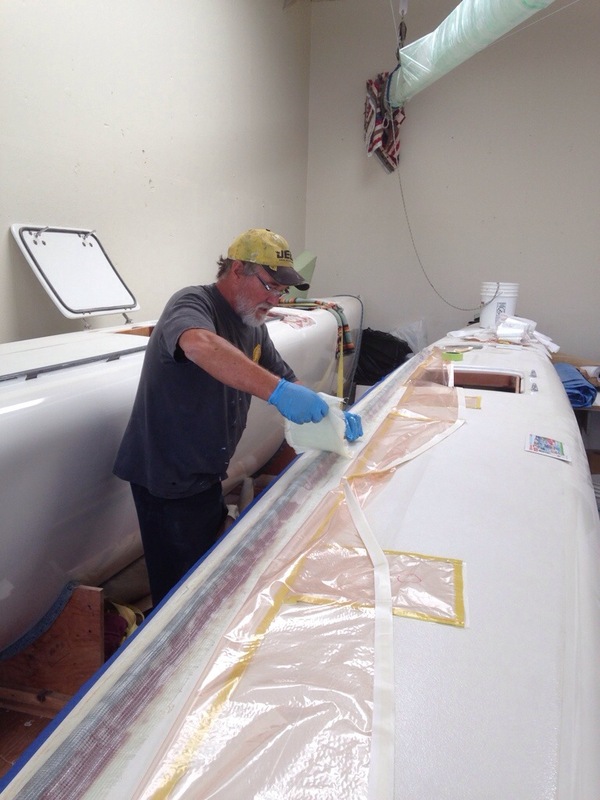 During careful placement of the 5′ carbon hinge tube, we had a “runaway thermal event”, meaning Greg blew it by trying to bond the 7/8″ carbon tube in to the centered 1 9/16″ channel cut into the foam core, and expecting to have that work in one fill ‘er up with epoxy putty pass. 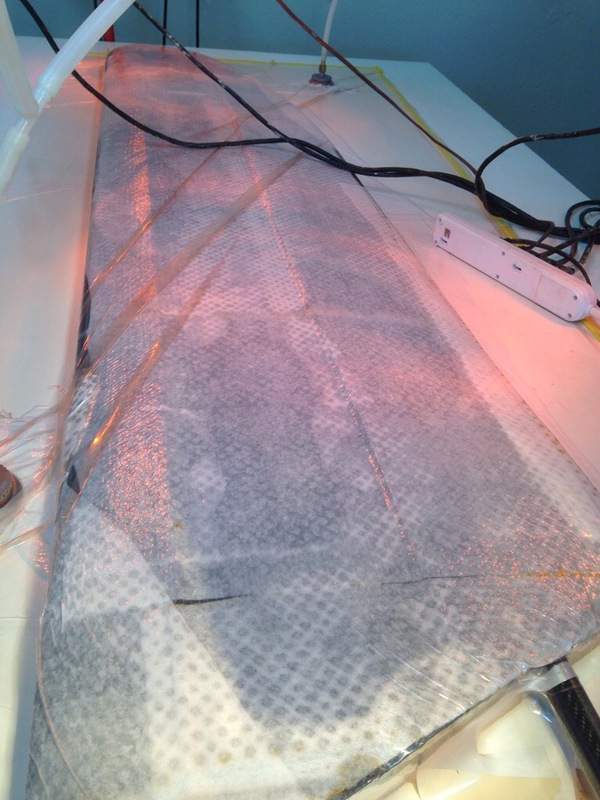 As I was seating in a uniform depth, the mass of wet epoxy down at the bottom was too great and it superheated quickly. Realizing the problem, I tried to yank the whole tube out and quickly evacuate the putty. Instead the carbon melted and bent the tube that needs to stay arrow-straight. What a huge mess, along with the panic of losing the very expensive 2 1/4″ shaped foam core and triple layer carbon spine. Here’s the work before the meltdown. 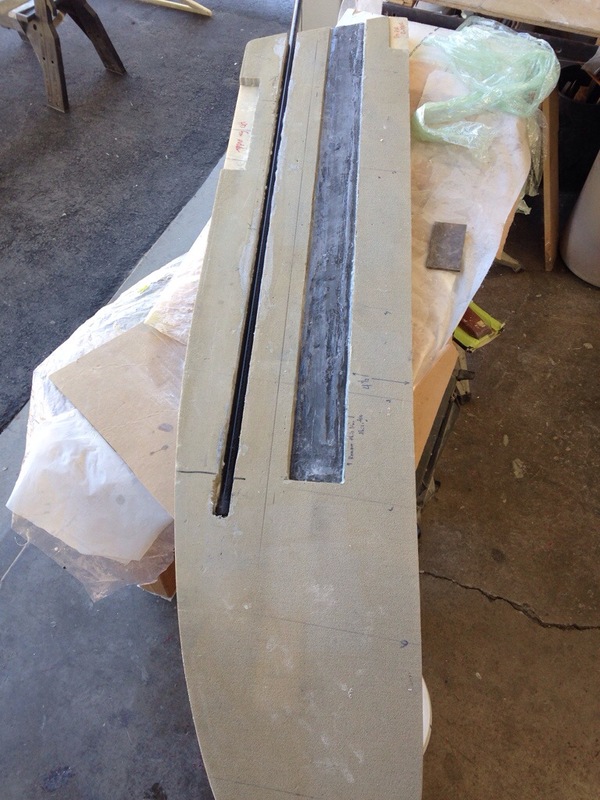 that’s the spine about to be bonded in – 3 layers of carbon around high density foam, then center the whole thing in the low density rudder core. 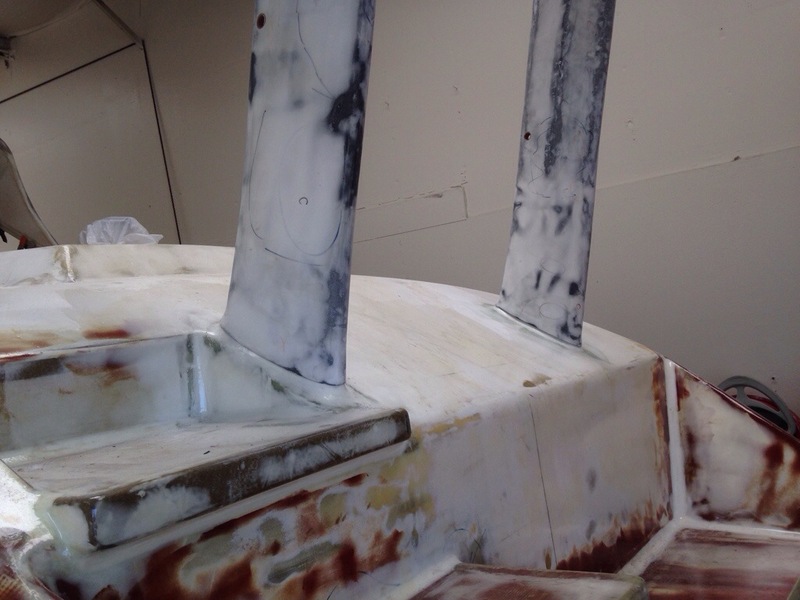 Also see on the left side the marks for the trim tab – it’ll be 4 1/2″ of the 16″ wide rudder and run about 3′ vertically. So Monday morning began with another $100 sent to Rockwest Composites in Utah to replace the pivot tube. 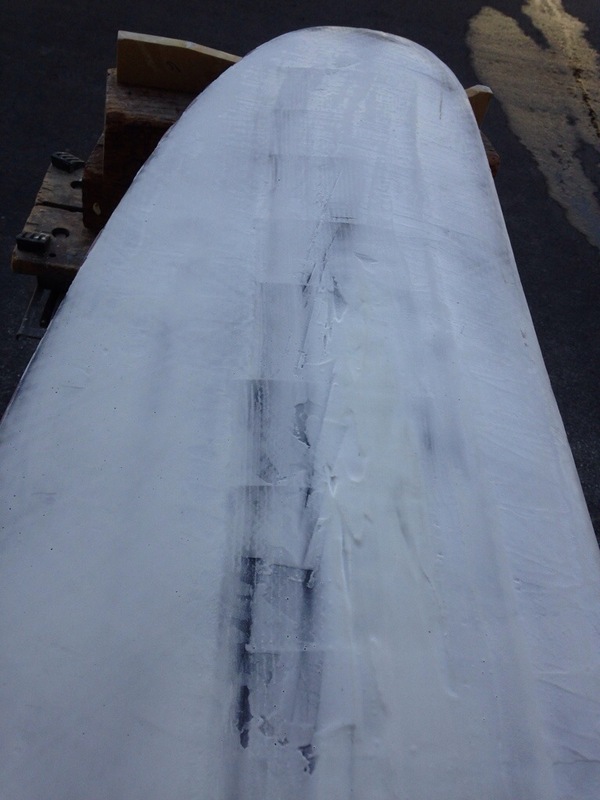 Monday night ended with a nasty two hour job of extricating the ruined tube and hardened putty from the soft rudder core. skilsaw, router, grinder and multi tool teamed up to make a fantastic mess but in the end the channel integrity is back and ready to take the new tube once the UPS truck drops by. We’ll do the bonding in multiple stages this time. Another expensive lesson learned.